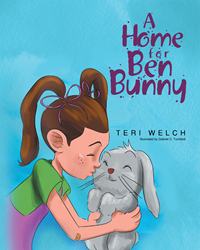 Recent release “A Home for Ben Bunny” from Page Publishing author Teri Welch is a whimsical story of a bunny that finds love and a new home. Teri Welch, a devoted writer and author, has completed her new book “A Home for Ben Bunny”: a heart-felt children’s story that is sure to touch the hearts of all readers. Teri Welch is an author and mother of two wonderful girls who is passionate about making the world a happier place by placing smiles on millions. In this busy, stressful society, it’s sometimes hard to find time to read with our children and be a bit silly. She is on a mission in writing short, silly books that can be read anywhere and find they are a great way to end a day with big smiles and giggles. Published by New York City-based Page Publishing, Teri Welch’s imaginative tale is a great bed time read. A little girl finds a bunny and is trying to find a wonderful place to call home for her new furry friend. She soon discovers it’s not a particular place that makes a home but that LOVE is what makes a true home. Readers who wish to experience this delightful work can purchase “A Home for Ben Bunny” at bookstores everywhere, or online at the Apple iTunes store, Amazon, Google Play or Barnes and Noble.